Because we believe that we need to be as transparent as possible, the Burlington High School administration took a risk and let the Boston Globe come in and shadow our staff as we moved forward with the state's new bullying legislation. Not only did we speak with Globe reporter Patricia Wen, we also let a Globe cameraman video a segment of one of our regular Student Support Services meetings. The article, Burlington school leaders confront bullying head-on, ran today in the Sunday Globe. We feel it is important for BHS and other schools to have constructive conversations about this topic and others that deal with the health and wellbeing of our children. We admit openly that we can improve in all areas and hope that the article portrays accurately the fact that we are a committed to doing so. The intention in our allowing a reporter and cameras access to BHS was not to say we are doing a better job than other schools in this area, but to show clearly the efforts that our school staff is putting in to keep our students safe and to comply with new state mandates. In closing, it is critical that we agree that posters (like the one above), legislation, and harsh penalties will not stop bullying. We have clear examples from similar campaigns, initiatives, and laws that have been put in place to deal with other problems in society like illegal drug use, underage drinking, seat belts, etc. 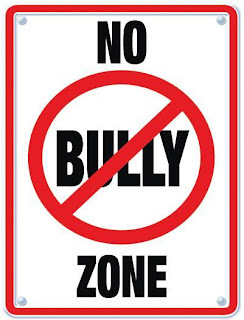 Legislation and punitive measures are a reaction and while it is quite easy to fill out bullying forms and suspend students for misguided actions, somehow I can't help feeling that when we get to this point we have already failed. The only thing that can keep our children safe is our commitment to deal with these issues constructively and to create environments where they know they are supported by caring adults. Thank you for taking the initiative and open this blog and for allowing the Globe's visit and reporting of the school. This page is evidence of your commitment to become proficient in using today's technology to remain connected to the community. Glad to see the Superintendent has a blog too and that ASCD is among your links. I look forward to visiting this site. Today Globe article highlighted the issues that exist in almost every high school - not just Burlington. Though there is still much work to do, it should be acknowledged that much work has been done to engage respectful behavior within and amongst the student population. Clearly, dealing with teenagers is not easy, however, the administration must also examine the interaction between the teaching and coaching staff and the students. Modeling respectful and appropriate behavior will be more impactful than a sign hanging in the hallway. I believe that we have one of the best schools in the geographical area. Burlington has always been a very strong and tightly knit community with incredibly supportive families and an absolutely wonderful staff and student body. I am a graduate of BHS and started teaching here over 30 years ago!!! I've worked in a lot of schools in the area, but frankly, Burlington is the BEST!!! I believe it was a good idea to let the Boston Globe into this particular subject because we need to show other schools that we mean business when it comes to dealing with bullying and that we DONT tolerate it at all! Mr. Larkin, it was courageous and valuable to others to open up your school in this way.